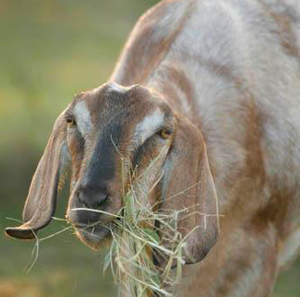 The Nubian type goat is most likely the oldest species of goat known to mankind. Some breeders feel the name Nubian is not an accurate name for the breed, due to the crosses made in its development. The name "Nubian" originates from Nubia, a desert region in Northern Sudan. It is said that the animals from this area did not play an important part in the development of the Anglo-Nubian. Although the French started working on the Nubian type animals before the English, credit must be given to the British for the development of the present day Nubian. Known as the Anglo-Nubian, the Nubian is mainly a combination of two pure breeds, the Anglo or English, and the Nubian, whose origin is more obscure, tracing to a variety of sources. The Anglo part of the ancestry includes the English breed and various cross-bred animals. Under the development of the Anglo-Nubian, regulations were in place to bring in new blood, provided foreign blood other than Nubian was not evident for a given number of generations. A small percentage of Swiss blood has in some cases been gradually introduced in this way. The first Nubians imported to England came from Paris, France in 1883. A pair named Arabi Pasha and Aida were said to be descended from stock sent several years previously from Nubian for the Society National d'Acclimation. Ali Baba was imported in 1891. Between 1850 and 1875 many other Eastern goats of Nubian type reached England aboard ships, brought to produce milk on the voyage home. 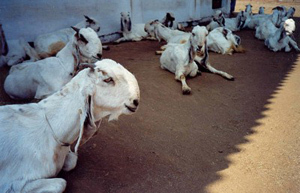 With no important restrictions in force, goats of foreign breeds, described as Persian, Abyssinian, Indian and Syrian were free landed and early prominent English breeders would go down to the docks and buy these goats. These early animals did not play an important role in the breed and were not recognized in the herd books. · No. 1. Sedgemere Chancellor. Nubian (Jumna Pari) Horned. Imported 1986. · No. 2. Sedgemere Sangar. Nubian (Waraiby or Zaraibi) Horned. Imported 1904. · No. 3. Bricket Cross. Nubian (Chitral) Horned. Imported 1904. · No. 4. Bricket Zoo. Nubian Hornless. Imported 1904. The two bucks imported from India, Sedgemere Chancellor and Bricket Cross, had the most influence in the development of the breed. The British Herd Book records no less than 72 progeny of Bricket Cross and 29 of Sedgemere Chancellor. The other two were less used and less successful. Sedgemere Chancellor sired the first recognized Anglo-Nubian star milker, Sedgemere Louise. The Jumna Pari was bred for meat and milk in India, was tall, rangy, slender and was normally horned. The Zaraibi or Saraiby from Africa was also tall and rangy, but was deeper bodied and usually very undershot. The coat was short and sleek except on the thighs and was any color or combination of colors and was normally polled. The Chitral, also from India, was thicker or heavier boned. The breeds in each case, had been specially selected and were kept for milk production in their respective countries where they were considered outstanding. In 1933 a rule against horned animals was adopted and was a hardship on the breed. Many great animals were discriminated against for being horned and were not used. Nubian type does were imported into America as early as 1896, but most of these early imports were lost to the breed until the import of three animals, buck, Holly Lodge Shingle, and twin does, Wigmore Brownie and Wigmore Pansy, by Mr. J.R. Gregg of California. Mr. Gregg imported another buck, Scriventon Bellerphone, and a doe, Luxor Butane, in 1913. These animals formed the nucleus from which Nubians in America descended. Mr. Gregg developed two important lines: the Bonzai line Holly Lodge Shingle, who was a grandson of Bricket Cross, and a great grandson to Sedgemere Sangers, and the Inkyo line from Scriveton Bellerphone. Between 1909 and 1918, Anglo was dropped from the name and forty were registered as Purebred Nubians in the United States. In 1917, Major C. C. Mowat brought in five Anglo-Nubians into British Columbia, Canada. The bucks he had were Harborough Volunteer and Edenbrook Cyrus, a pure white hornless sire of many Nubians including Spring Beauty AR#7, the first Nubian to qualify for an AR. 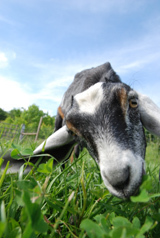 Nubians are the most popular breed in the United States and continue to outnumber all the currently recognized breeds. Reference: Nubian History and Great Britain, Second Edition, Revised. By Mrs. Robert M. Reinhardt and Alice Hall.